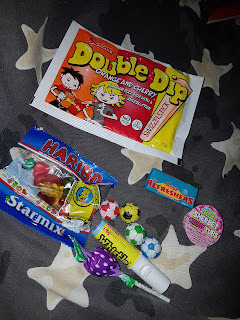 Is this really my life....: The never endless task of choosing party bag fillers made easy! 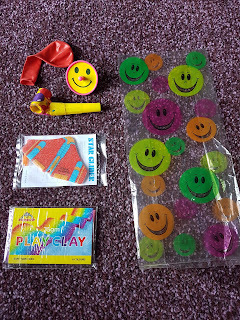 The never endless task of choosing party bag fillers made easy! 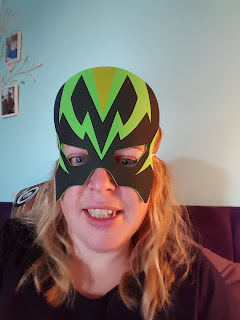 If going by what past birthday parties has been like this year I'm being prepared for filling the bags and being very careful not to over spend. 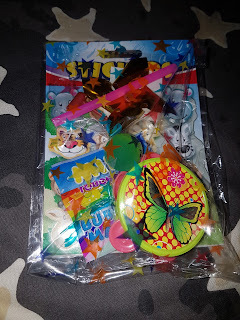 Last year I think I spent over £50 for party bags and fillers for 32 children. I started researching companies a few weeks ago and found one that was very good priced and they send it all to you in the post carefully bundled to help them not have them go al over the place and get broken in the box. 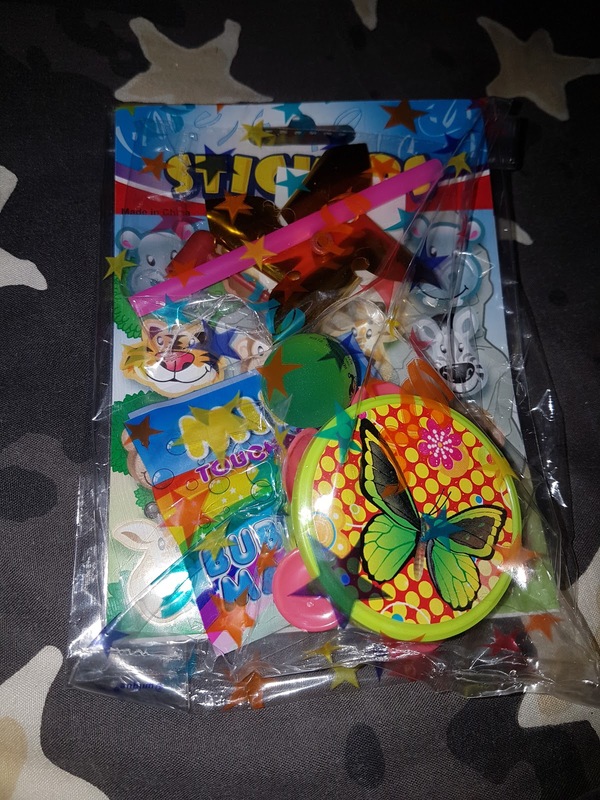 The different prices for the party bags vary between cheapest being 70p each and the most expensive is £1.80 each. I had one of each of the bags delivered so I could see the contents and make up my own mind on which I preferred. 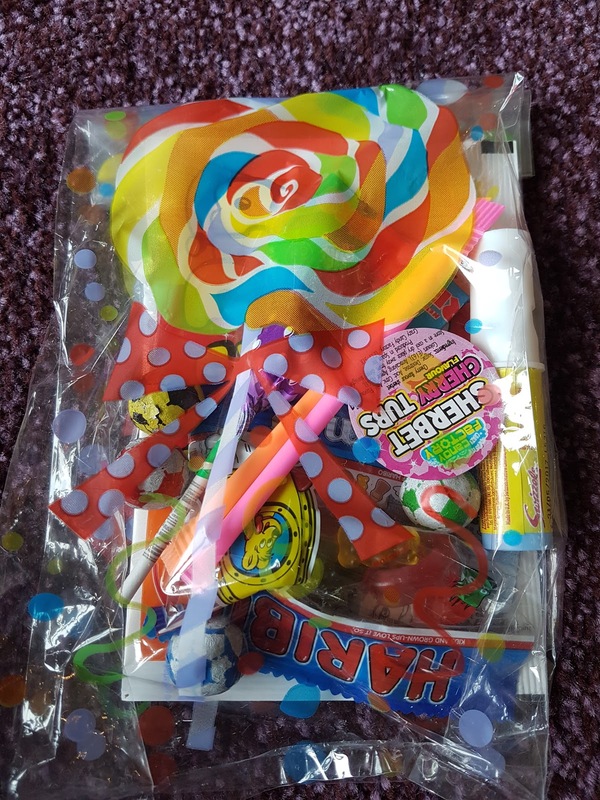 Taking into consideration for each bag in a normal child's party a slice of cake would be added to the bag also. The first bag and the cheapest of all is the smiley bag. For 70p I thought this was a nice little price as modelling clay can be quite expensive. The stunt plane is very cute despite being smaller then the ones I used to buy from the shop for 50p each and this one flies a lot better, well loop the loops ( queue the standing on the chair or couch to have a contest on who can throw the farthest). The added bonus was it was already made up so all I would need is cake to put inside the bag and thats that bag ready to be handed out. The super hero bag, I'm such a big kid so this is my favorite choice. I'm so in love with anything super hero at the moment and honestly TJ just looks at me like MOM what are you doing?? So embarrassing. The Super hero party bag is packed with as the name suggests super hero items. 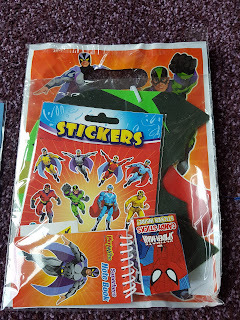 Spider-man Candy sticks ( white sweets in long rolls). 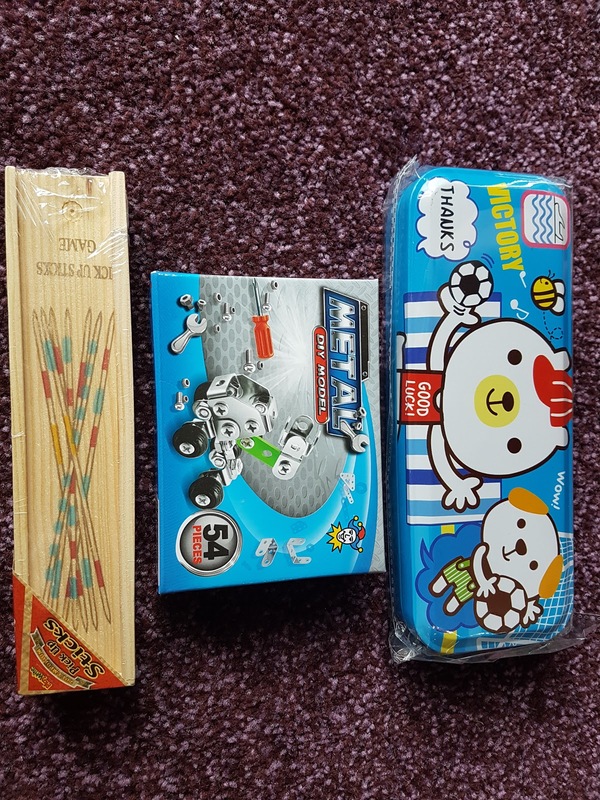 For starters in this pack the candy sticks are a good size packet and a few entertaining themed party bag. 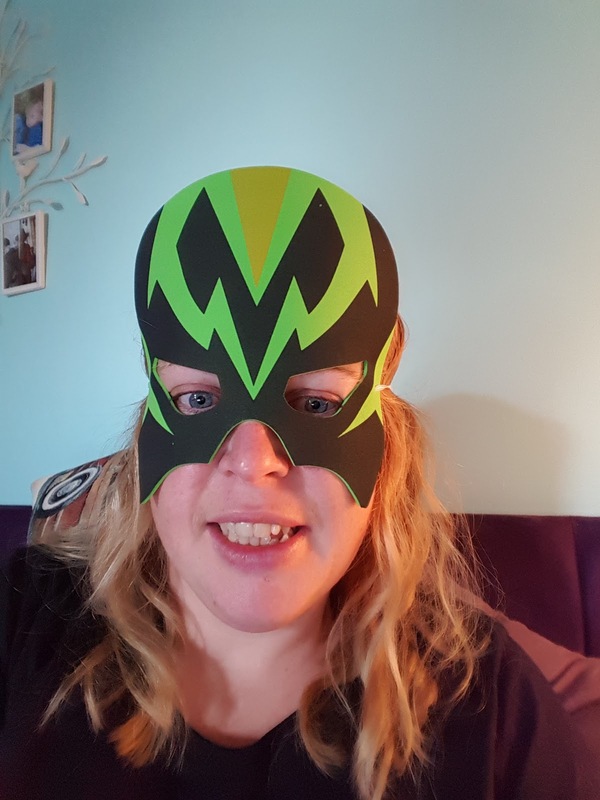 Isn't super heroes all the rage at the moment with all boys? So this one would be perfect for any age. 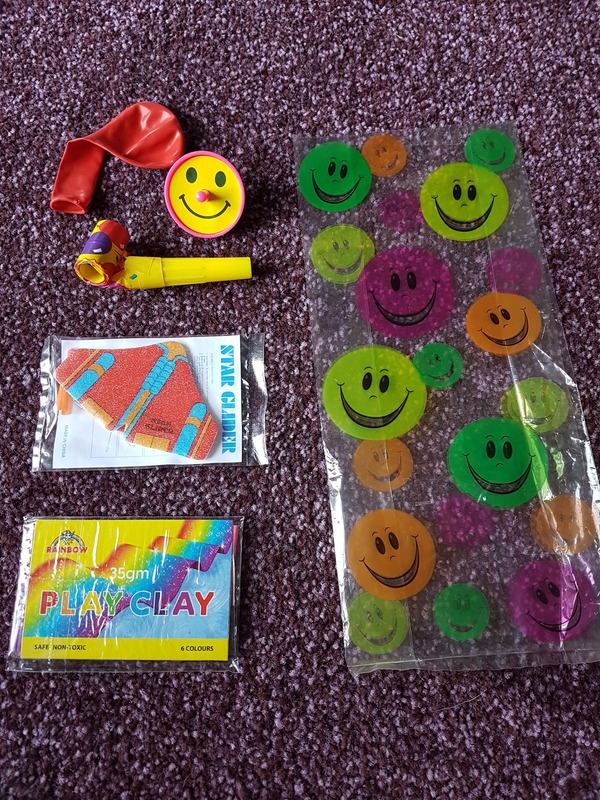 These bags are priced at 90p each. Hidden in the Spider-man candy sticks is another smaller tattoo which was a nice little surprise for when we ate them. The next two options are both priced at 95p each but both are very different with the contents. I know from experience when buying sweets separately it costs a small fortune so for all these to already be made up into a bag suits me. (lets face it kids mainly like sweets in a party bag). My favorite sweet in this pack is the double dip sherbet and the refresher bar which takes me back to my childhood. Is it so bad when ive just spent the last hour throwing the little rubber ball between my legs, over my shoulder against the wall, door or any other surface to dry and get it to land in a small pot? I didn't think so either and the best part i had fun doing it with TJ. The bubbles are amazing although we have yet to blow one bigger then 2 cm. I currently have one sat on my knuckle waiting for it to pop..... just like that. The mini windmill is no bigger then my hand but i like that as it will fit in the little garden tub outside my bedroom window. 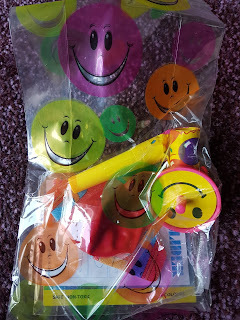 This bag is priced at 95p each and given the amount of fun we've had this afternoon its worth every penny. 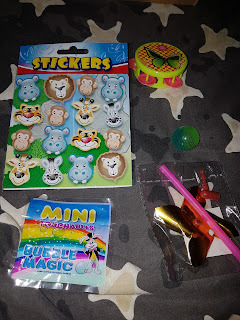 Personally I think this is one for the ages of 5-6 years old as it needs a bit of reading to be able to do the magic trick and concentration also as there are a few fiddly bits. Now were talking the finger rocket is amazing! This another favorite of mine as I am completely rubbish at flinging an elastic band off my finger. The rocket on the other hand has just made my day. Hairy Harry is fascinating to do and with the fact that it can draw hair on the face in the picture its a new found must have for every party bag this year. The price of this bag is £1.35. 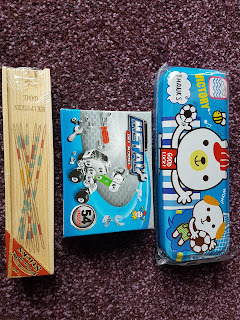 Among the bags I also received some prizes these were pick up sticks, a tin pencil case, a toy similar to meccano (which has now gone missing) I think someone didn't want to share that one. There's so many things to choose from on the website and if you don't like what's in the bags them you can make up your own. Jennifer was lovely and for every question I had there was an answer within 30 minutes. For asking her anything she's such a lovely person and ever so helpful. Acropats bath times made fun again..